The stock soared as the retailer posted a much-needed turnaround in profitability. Shares of yoga apparel specialist lululemon athletica (NASDAQ:LULU) shot up 24% in 2016, according to data provided by S&P Global Market Intelligence. Shareholders experienced plenty of volatility in the year; at one point they enjoyed a 50% gain that quickly evaporated before shares climbed back to more than 20% growth. 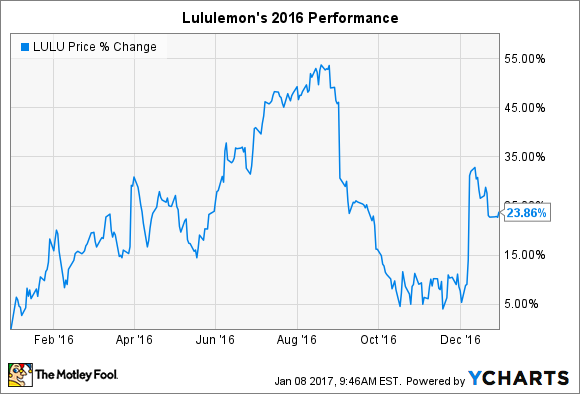 The rally corresponded to a strong rebound in Lululemon's business trends -- especially on the bottom line. In March, the retailer announced 5% comparable-store sales growth, and it continued to post a solidly positive comps rate throughout the year. In fact, comps ticked up to a 4% expansion pace in its final quarterly announcement of 2016. The news was even brighter with respect to earnings. 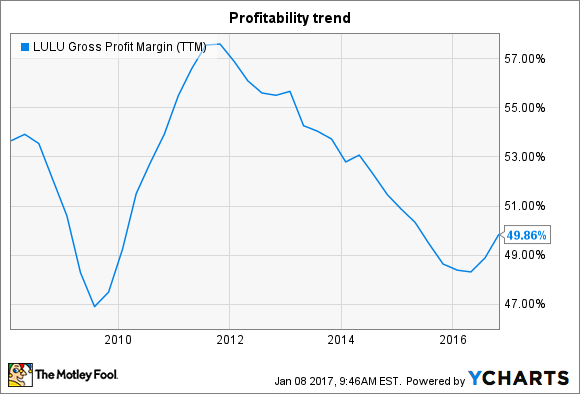 Following nearly five consecutive years of declines, gross profit margin increased in the second and third quarters. CEO Laurent Potdevin told investors in early September that management "saw an important inflection in our gross margin and earnings performance," and that momentum appeared to hold. Profitability rose to 49% from 47% in the second quarter and expanded past 50% in the third quarter. The holiday quarter is typically Lululemon's most important, and investors won't know how the retailer fared against intense competition until its fourth-quarter report comes out in early March. The official outlook calls for $775 million of revenue, which would translate into a 10% increase over the prior year. Wall Street is slightly more optimistic, as consensus estimates target sales just north of $782 million. Lululemon entered the holiday period with healthy customer traffic trends and a lean inventory position, which suggest investors could see solid gains on both the top and bottom lines in the fourth quarter. But its 2016 rally pushed shares up to a pricey valuation -- 33 times trailing earnings -- leaving little room for execution slip-ups in the new year. Regardless of what the stock does, though, Lululemon shareholders should keep a close eye on gross profit margin to see whether it continues climbing back toward the retailer's record 57% mark -- or ticks lower again as sales growth rates disappoint.